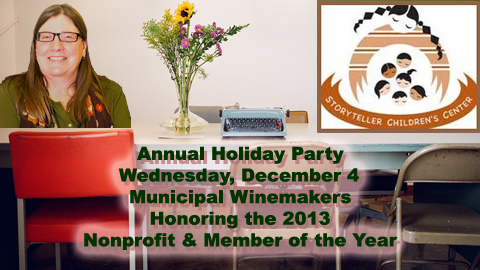 AWC-SB will host their annual holiday party on Wednesday, December 4, 6:30-8:30 pm at Municipal Winemakers. At this event members and friends will celebrate holiday cheer along with honoring our Nonprofit of the Year, Storyteller Children’s Center, and AWC-SB Member of the Year, Lisa Angle. Nonprofit of the Year Storyteller Children’s Center provides quality, tuition-free early childhood education for homeless and at-risk children, as well as comprehensive support services for their families. AWC-SB requests attendees of the holiday event bring an upwrapped children’s book for Santa’s bag when he visits the center. Member of the Year Lisa Angle of Ninety Degrees Media is a freelance webmaster, videographer, and social media coach, as well as a writer. As an AWC-SB board member she has worked on our awcsb.org website, our e-newsletter, and posted videos of our program meetings. She also participates on the AWC national Professional Development committee. This entry was posted in Past Events on November 18, 2013 by Lisa.